The beautiful, bizarre and fragile world beneath your feet. Thirty-two miles east of Del Rio, where Las Moras Springs bubbles out of the earth, the town of Brackettville marks the southwestern margin of the Balcones Fault Zone: a 5- to 40-mile-wide sector of ancient tectonic activity that cuts a 200-mile curved swath from Brackettville east and then north to just short of Waco. The Balcones Fault Zone marks the division between two very different geographies. To the east is the rich, low-lying farmland of the Texas Coastal Plain. To the west, at higher altitude, stretches karst. “Karst is a landscape formed by the dissolution of soluble rocks,” says hydrogeologist George Veni, a transplanted Texan who now serves as executive director of the National Cave and Karst Research Institute, based in Carlsbad, New Mexico. Texas karst areas are marked by sinkholes at the surface, and caves and springs below. Karst comprises approximately 20 percent of Texas. Four kinds of rock — limestone, dolomite, gypsum and rock salt — lend themselves to karst development. 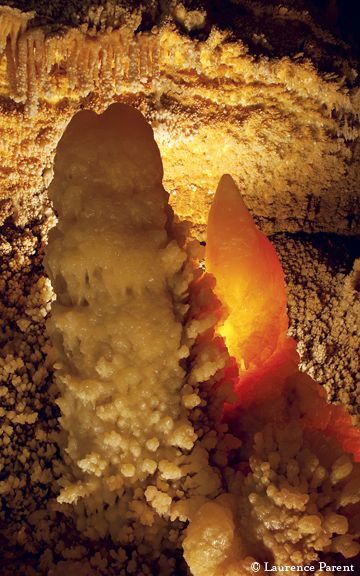 It’s the first two chemically ­related types — the carbonates — that account for the majority of karst in Central Texas. One hundred million years ago, when dinosaurs still roamed the earth, Central Texas was under a shallow sea teeming with life. As plankton, corals and shellfish died, their calciferous skeletons accumulated on the sea floor, where, over geologic time and under tremendous pressure, they compacted into layers of limestone. Over the next 35 million years, the coastline advanced and receded several times. During each submersion, limestone beds accumulated, each unique to its own time period. Eventually — perhaps 50 million years ago — the seawaters retreated for good. Around 15 million years ago, a series of tectonic (earth shifting) events in the Balcones Fault Zone broke up the limestone layers. Some were raised and exposed to the surface by erosion, while others remained buried and dropped even further underground. Surface water began to enter the newly exposed rock outcrops, adding to the karst-forming processes of dissolution and erosion already taking place underground. Today, the Edwards Plateau, a great expanse of limestone formed during the Cretaceous Period (146–65 million years ago) stretches westward from the eastern fringe of the Balcones Fault Zone to the Pecos River. These limestones — named the Edwards Group — together with the fault zone itself, harbor the majority of Texas’ caves and aquifers. But caves of comparable age also occur in much-older limestones formed during earlier periods. They can be found in the Llano area (Ordovician limestone, 500–440 million years ago) and in West Texas and the Big Bend area (Permian limestone, 296–245 million years ago). Most Texas limestone caves were carved out between 2 and 15 million years ago. In the Panhandle and in Culberson County, gypsum, a chemically different, non-carbonate rock type, plays host to significant karst areas that include some unusual fast-growing sinkholes like the famous Wink Sink. The Edwards Aquifer traces a 200-mile course beneath the Balcones Fault Zone from Brackettville to Austin and provides drinking water to 1.7 million people in the San Antonio area. Surface water originating as rain freely enters the Edwards Aquifer via stream beds, sinkholes and fractures. There it adds to the aquifer, some of whose waters may have lain underground for thousands of years, nearly still, within the limestone’s microscopic matrix. The vast majority of the water, however, moves rapidly, through conduits that are finger-sized or larger. The aquifer’s water is stored in a highly permeable limestone bounded by less permeable layers above and below. It is about 500 feet thick, exposed at the surface throughout the fault zone and Edwards Plateau and buried more than 2,500 feet deep where faulting drops it underground toward the Gulf Coast. Its water table averages an elevation of 1,100 feet above sea level near Brackettville and gradually descends to an average 450 feet near Barton Springs in Austin. Artesian springs, such as those in Austin, San Marcos, New Braunfels, and San Antonio, occur where the water table extends above the land surface. Where the land rises above the water table, water must be pumped from the ground. In 1895, workers drilling an artesian well in San Marcos came across an unusual salamander. Eyeless and translucent, with feathery red external gills, the spindly-legged 5-inch-long creature was a breeding adult stalled at a juvenile stage of development, like a tadpole that never grew up. Scientists have found many more biological curiosities since the Texas blind salamander was first described. It’s well known that mammals from bats to bears take advantage of the shelter that caves afford. Bats, the best-known denizens, roost by day and at night emerge to feed, often on insect pests: The colony of 20 million Mexican freetails at Bracken Cave near San Antonio consumes some 200 tons of moths and beetles nightly. But within the subterranean depths dwells another, very different kind of life, one that few of us have had occasion to encounter. These denizens of the dark are called troglobites: fish, salamanders, shrimp, beetles, spiders, harvestmen (daddy longlegs), centipedes, millipedes and other less-familiar species. Evolved in isolation, they can live nowhere else. But they are exquisitely adapted to life in their circumscribed environment. The karst systems of Central Texas are extraordinarily rich in troglobites. That’s no coincidence: the region’s geological history and present-day terrain have created the conditions that lead to highly specialized adaptation in its biota. “You’ve got things like the Colorado River, a major barrier to species,” says Jean Krejca, president of Zara Environmental LLC, a Buda-based karst management firm specializing in endangered species. Species barriers are geographical features such as streams and mountains that prevent two previously connected populations from reaching each other to interbreed. These previously similar populations begin to diverge, to evolve at their separate rates, over many years, in different directions. In the case of exclusive cave dwellers, eyes gradually disappear, pigment fades, and appendages lengthen. Some surprising inhabitants are found underground. Krejca points out an isopod — a tiny pale crustacean that’s a distant cousin to a pill bug (aka roly poly). Its closest relative, genetic studies show, lives at the bottom of the ocean, in marine vents. So how did it end up in a Central Texas cave? The answer goes back to 60 million years ago, when Texas was still under a shallow sea. Then there are the trogloxenes: creatures that must spend part, but not all, of their life cycle within a cave, like a cave cricket, which has tan coloring and elongated antennae but normal eyes. Crickets play an important role in cave ecology. Like bats, they leave the cave at night to forage. These crickets are largely herbivorous. They, in turn, contribute nutrients to the cave community by becoming a food source for many of its inhabitants. Certain beetles, in fact, are adapted to eating cricket eggs, with long, narrow heads that have evolved to reach into the tiny holes in mud or clay where the crickets deposit their eggs. Today, some Texas troglobites are in trouble, through both the introduction of non-native species like fire ants and the activities of man. Over 20 species, including the Texas blind salamander and several cave beetles, are listed as endangered. Habitat necessary to the survival of endangered species, designated critical habitat, is regulated by the U.S. Fish and Wildlife Service, and property owners — be they private developers, military bases or state parks — are charged with devising acceptable plans for land management. Consultants like Zara are kept busy providing a wide range of services, from species population inventories to drafting management plans. Development poses the greatest threat to sensitive cave communities. Toxic spills and fertilizer residue make their way to the water table. Impervious cover replaces important topside vegetation and alters drainage patterns. Cave communities have major ecological contributions to make. They are composters, returning nutrients to the soil (crickets, harvestmen, beetles and many others). They are pest exterminators (bats). And, with their sensitivity to pollution and other environmental disruptions, they are bellwethers of conditions outside. They thrive where the surrounding land thrives. Likewise, healthy aquifer communities point toward safe, uncontaminated water. By placing nets over selected artesian wellheads when the wells are opened, the researchers hope to answer those questions. They’re particularly eager to find two species of blind catfish last seen 30 years ago, in order to genetically test the pair for clues to their ancestry. Schindel has a hunch the fish might not be all that rare, just difficult to spot. “It’s kind of like identifying the wildlife in the forest by looking out through a window,” he says. Then again, three years of monitoring 50 wells on public and private land — each at least twice and some up to 25 times — will provide a lot of windows and, hopefully, a lot of answers. “It’s a very exciting study,” he says. Caves have held an attraction for man since prehistoric times, with a wide range of human activities taking place within their depths. In the lower Pecos River region of Texas, hunter-gatherer residents of 6,000-1,000 years ago used caves for burials and left a vivid record of their presence in paintings on rock shelters in the area. For modern-day cavers, the lure remains. Sundry motives fuel their passion for exploring underground: the love of adventure, natural beauty, scientific discovery, physical challenge and more. Texas caves are as diverse as the cavers who roam their passages, offering something to suit everyone. For sheer beauty, the Caverns of Sonora in Sutton County rival caves worldwide, with their sparkling chambers of pure white or mineral-tinted formations. A very different, watery setting greets wet-suited ­visitors to the state’s longest cave, Honey Creek in Kendall and Comal counties, which comprises more than 20 miles of active stream passageway draining to the Guadalupe River. In Edwards County, the legendary Devil’s ­Sinkhole — a 350-foot deep pit caused by the roof collapse of a giant underground chamber — boasts a large bat colony as well as an intriguing 133-year history of exploration and exploitation. 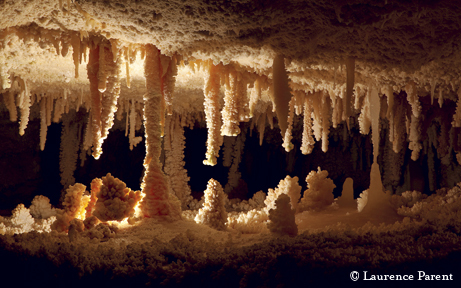 “Long, tight and dusty” are words to describe Airman’s Cave in Travis County, a popular destination for Austin locals. Enchanted Rock Cave, a granite cave in Llano County, is an example of pseudokarst, in which caves are formed in non-soluble rocks by processes other than dissolution. From three-dimensional mazes to steep drops to stunning decorations, the charms of Texas caves have cavers coming back again and again. Sometimes, for decades. Blair Pittman’s romance with the underground dates back to his first visit to Carlsbad Caverns when he was just five years old. “I was hooked,” says the pioneering cave photographer. Pittman, who grew up in Pecos, had to wait a few more years for his first wild cave, the formidable Devil’s Sinkhole. But in 1949 at age 11, accompanied by an adult friend, he gingerly descended 150 feet down a ladder made of sheep-wire fencing to the top of the guano mountain that rises from the depths of the enormous pit. Soon he was caving regularly. And, entranced by the beauty of the formations he saw — and eager to share it with his parents — he began to teach himself the difficult art of taking pictures below ground, starting with a simple Brownie Hawkeye. Throughout the 1950s and 1960s — the “Golden Age of Texas caving” — he continued to hone his photographic skills in a wide range of caves in Texas, adjoining states and Mexico, making multiple trips to many. He participated in the early explorations of such great show caves as Natural Bridge Caverns, Inner Space Cavern and, especially, the Caverns of Sonora (then called Mayfield Cave), which became his personal muse. “Once I got into Mayfield Cave, that was it. Trip after trip after trip to it only, photographing the fantastic formations,” he says. He also worked there with developer Jack Burch to help develop the trail and electrical systems. Photographic prowess led to a professional career. In 1962, he joined the Denton Record Chronicle staff, moving in 1964 to the Houston Chronicle, where he stayed until 1978. Next came a five-year stint with National Geographic, followed by years of freelance work. Caving took a backseat to job and family concerns, though he still found opportunities to cave in England, Ireland, Malaysia and Ecuador, while racking up a long string of photography awards. In 1995, when Texas A&M University Press contacted him about doing a book, he had been out of serious caving for almost three decades. “I’d forgotten how hard cave photography is,” says Pittman, who was soon squeezing through tight passages and floating heavy equipment down subterranean rivers to revisit locales he’d photographed years before. Texas Caves, published in 1999, contains 66 of his finest photos, old and new, along with 33 more by other eminent explorer/photographers of his era. Today he’s retired to a cabin in Terlingua Ghost Town in the Big Bend, a stone’s throw from an abandoned mine, a natural cave and a 150-foot pit. And though busy with other projects, like penning two slim volumes of local lore, he still caves on occasion. “But I stay away from the tough stuff,” he says. Austinite Bill Russell has devoted the greater part of his 72 years to discovering, exploring, mapping and documenting caves. As a youngster growing up in Tulsa, he would dig a trench, put boards over it, cover them with dirt and crawl inside. “I always liked to be under things,” he says. He arrived on campus just in time to join the newly formed UT Grotto and participate in the explosion of organized caving then taking place around the state and in Mexico. Things were simpler back then, with far fewer restrictions on cavers than today. “The Devil’s Sinkhole had just a sign by the road to mark it,” he says. “And when we first found Mexico, it was enormous caves, unimaginable beauty, wonders after wonders. Entrances big as houses going into the mountainside that no one had ever gone into.” After graduation, he worked for a time as a research assistant to a Texas Tech University professor engaged in blindfish studies. However, the burden of grantwriting duties plus the desire to work on his own projects eventually led him in a different occupational direction. He joined the Internal Revenue Service. He retired from the IRS in 2006 after more than three decades as a tax examiner. Today, he’s busier than ever with administrative chores like writing reports and updating the TSS files. And digging. Most afternoons find him out searching for new and “lost” caves in Travis and surrounding counties, often with a crew of enthusiastic younger helpers. They follow nature’s clues: air blowing out of the ground, a suggestive depression in the earth. Then they dig. “I like digging in itself and I like going to the caves I find, so it’s a double payoff,” he says. While painstakingly clearing rocks and dirt away from a hole is a far cry from the rigorous explorations of his younger days, Russell keeps in shape. He frequents challenging Airman’s Cave — scene of numerous rescues — and can reach the back in five hours, a fast time by Airman’s standards. Has he slowed down any since his youth? Texas has two organizations specifically dedicated to the preservation of caves and underground resources. 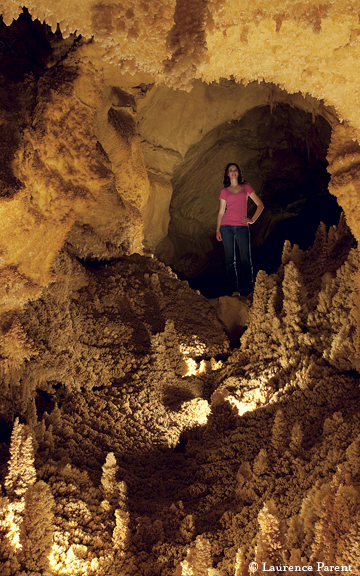 During the week of July 19–26, 2009, some 2,000 cavers, karst scientists, environmentalists and educators representing more than 100 countries will converge on Kerrville for the 15th International Congress of Speleology. Participants in the worldwide event — held every four years since 1953, but rarely on U.S. soil — will choose from a wide range of activities including caving trips, seminars, workshops and competitions. Salons will display the best in cave-related photography, art and mapping, and vendors will offer up the latest in equipment. The congress, open to registrants, is geared to those with a serious interest in speleological science and exploration. (www.ics2009.us).